Baedeker and Keller offer descriptions almost identical in both content and organization. But how do they differ in their representation of the Admiralty, a site of foreign military power? Both guidebooks refer to Nikolai Gogol as a “poet” – how can we interpret this overlooking of Gogol’s place in Russian literature as a prose writer? 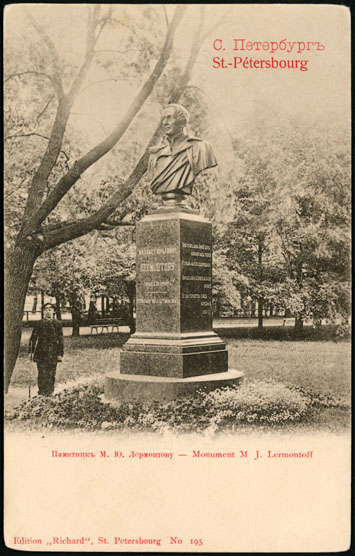 Is Gogol’s position lost for the tourist when his bust is juxtaposed in the text with the statues of two famous Russian poets, Zhukovskii and Lermontov? Is this misnomer also a gesture of appropriation on the traveler’s part? Nikolai Gogol’s novel Dead Souls (published in 1842) was indeed subtitled “poema” and Gogol referred to it as a “lofty poetic creation in prose.” But even if for Gogol his work escaped generic confines, it is nevertheless regarded as Russia’s first major novelistic creation. The novel follows the adventures of Pavel Chichikov as he tours the Russian countryside and visits a peculiar set of landowners, offering to buy serfs who have died since the last census. As the scholar Donald Fanger has shown, the text is organized and dominated by the road. It opens with an arrival and ends with a departure. Along the road, the text affords views of Russian landscapes, people and places. In this sense, it is a novel about domestic travel and travel encounters. 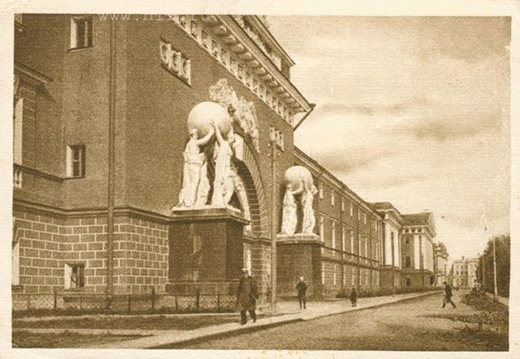 Keller misnames “Dvortsovy” Square by omitting its feminine ending whereas Baedeker gives its accurate name “Dvortzovaya.” Is this omission unintentional or also a mode of making familiar the otherwise strange name (and concept of grammatical gender)? In a Gogolian gesture, Baedeker focuses on exact dimensions: size, height, width, and length, and gives precise figures for the Admiralty’s properties. In this way he emphasizes the tourist’s perception of the building’s grand scale and lavish decoration. Hence, the Admiralty becomes a sight, a tourist attraction rather than a seat of naval and administrative power. 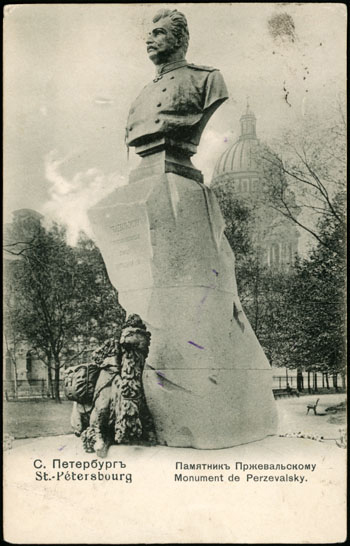 In front of the Admiralty, on the N., are two bronze Statues of Peter the Great, by Bernstamm (1909). In one he is represented as building a boat, in the other as saving drowning men. 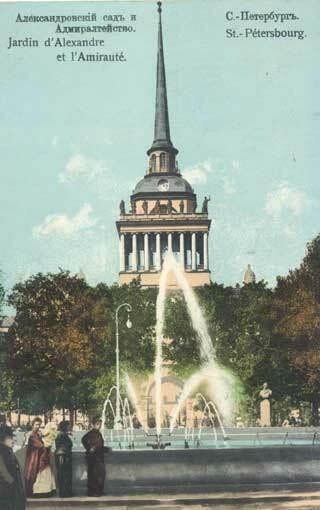 To the S. of the Admiralty is the Alexander Garden, with a fountain, near the Gorokhovaya, and several bronze busts. To the E. are the poets Zhukovski (1783-1852) and Lermontov (1814-41), and the composer Glinka (1804-57); to the W., the poet [sic] Gogol (1809-52) and the Asiatic traveller Przhevalski (1839-88). 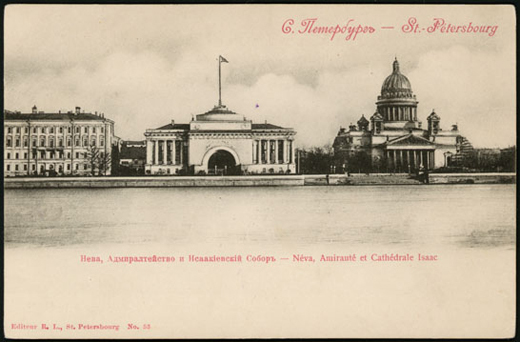 To the north of the Admiralty are two bronze monuments of Peter the Great built by Bernstamm. One is of Peter making a boat, the other of Peter saving the Drowning at Lake Ladoga. To the south of the Admiralty lies the Alexander Garden with a fountain and several Busts in bronze: on the east, the poet’s Zhukovsky (1783-1852) and Lermontov (1814-1841) and also the composer Glinka (1804-1857); on the west, the poet [sic] Gogol (1809-1852) and the Asiatic Explorer Przhevalsky (1839-1888).